The complimentary breakfast buffet outdoor pool and free Wi-Fi add up to welcome perks at the non-smoking Holiday Inn Express Augusta East within walking distance of the convention center. Mini-fridges microwaves coffeemakers and cable TV are featured within all 117 rooms at this six-story Holiday Inn. Corporate guests can make their way to the business center and appreciate the free Wi-Fi access. Each morning complimentary breakfast is included. Guests can also kick start their cardio in the fitness room and enjoy a refreshing swim in the seasonal outdoor pool. 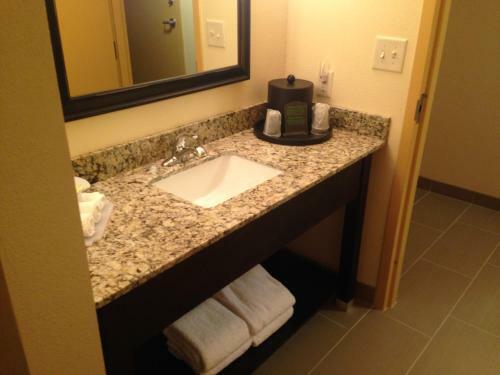 The hotel offers laundry facilities and free parking. Two blocks south of the Augusta Riverwalk bordering the Savannah River the Holiday Inn is set in downtown Augusta within a 15-minute walk of the Augusta Convention Center. Art lovers are one mile from the Morris Museum of Art and three streets away from the Augusta Museum of History. Guests are nine miles from Augusta Regional Airport and 66 miles southwest of Columbia Metropolitan Airport. Add Holiday Inn Express Augusta Downtown to your free online travel itinerary.